Why AGM LS conversion in a jeep JK? What will a LS conversion due to my fuel economy? In most situations depending on your selection tire size and weight of vehicle a LS engine produces better fuel economy than the stock engine because it is not working as hard, with variable valve timing and active fuel management these are the most efficient V8 engines available for a JK conversion. How much weight will the GM powertrain add to my jeep? The average Jeep Conversion adds approximately 125 pounds. How do you pass emissions with a GM engine in a jeep JK? With appropriate emissions equipment pending year and mileage your vehicle will be delivered with a California certificate. Who can service my LS powered JK? With the addition of your GM powertrain we add a GM OBDII service port and check engine light. All body control functions Dash ABS TIPM etc. are monitored by the jeep electronics. All engine, transmission and emissions related functions are monitored by GM electronics. Anyone can pull codes from basic scan tools to diagnose. All service parts i.e. belts hoses alternator starter are available off-the-shelf at any retail parts supplier. You will be provided a basic service parts breakdown for your vehicle. Will my jeep drivetrain hold up to a GM LS powertrain? Depending on desired tire size and driving techniques, GM vehicles hosting LS engines come with equivalent sized components to the Jeep JK. It all depends on your right foot. What LS engines or a mission is legal in the JK Jeep? We currently offer 5.3 or 6.2 packages for an emissions compliant vehicle with 330HP-440HP. Technology applies on any GM GEN three or four engine from 4.8L to 7.4L, 285 to 700+ horsepower. More options are under development at this time. How long does a Turnkey Jeep Conversion take? You will be without your vehicle 4 to 6 weeks including vehicle emissions certification and up to 400 miles of road testing. Other modifications to the vehicle done by Turnkey can add to additional lead time. Will AV eight Jeep engine swap affect my suspension or spring rates? Why a Turnkey Jeep Conversion? At Turnkey Jeep we have over 20 years of experience in conversions and have been on the ground floor of the GM GEN three and four LS revolution with personal passion for Jeep vehicles. 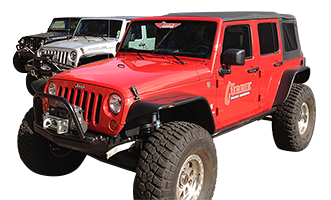 We strive for the cleanest integration of LS power with the versatility of a Jeep. Can I buy the parts to do a conversion myself? Sorry we do not offer that at this time however we are working on a plug and play package for competent shops and mechanically and electrically inclined individuals at this point the customer service demands for a DYI swap would not be feasible. With a V-8 Jeep swap what functions will I lose? The only function that is lost is traction control function of the ESP (electronic stability control) why would you want traction control in a V-8 Jeep that would defeat the purpose. Is there any body, chassis or interior modifications required? No a LS engine when properly positioned looks as if it came from the factory other than the removal of the jeep motor mounts and installation of the LS JK engine mounts there are no other major modifications to the body, chassis, frame or interior of the jeep even the stock shifter is retained.